Aurum Property Partners offers examples in which our expertise reconditioning, reinvigorating, remediating, and remarketing properties has resulted in success stories we’d like to tell about a variety of properties with a range of needs. The South Florida Medical Portfolio consisted of eight medical office buildings totaling 636,091 square feet located on five different hospital campuses throughout South Florida. The buildings were poorly leased with significant near term rollover and below market rents. The buildings also required substantial maintenance and capital repairs. The seller, Tenet Healthcare, did not focus attention to the assets. We repositioned and rebranded the portfolio to a higher asset class with significant improvements and upgrades to the buildings’ exterior, mechanical systems and common areas ($6 million). We significantly improved tenant satisfaction by introducing our gold standard management and leasing platform, providing a dramatically higher of level service. We converted many leases from gross to NNN or gross with expense stops. Our team created an institutional grade portfolio with a stable and diversified rent roll and market leases. We increased occupancy in the two significant buildings (Palmetto Medical Plaza and the Victor Farris Building) from 78% to 85% (We increased overall occupancy by 5%). We grew stabilized net operating income by 21%. Six of the eight buildings in the portfolio were sold after a three year hold period, to a publicly-traded REIT (HTA). **Select individual building case studies shown below. A nine-story, 155,000 square foot Class A medical office tower. Attached to Good Samaritan Medical Center. Acquisition: October 2010 (as part of a nine building medical portfolio in South Florida). The building suffered from deferred maintenance and had fallen from its original Class “A” level to Class “B-“. The building had original finishes from the late 1980’s. Many tenants had recently departed to newer buildings and the remaining tenants were disappointed with the deteriorating conditions and level of service. In its current condition, the building was not generating any leasing activity. We completely reconditioned the property. We brought the property back to the market with its same historic name, but with a new reinvigorated appearance. Over a two-year period, we implemented an extensive $2 million capital improvement project. Work included replacing the roof, waterproofing the exterior envelope, renovating the cooling tower and mechanical equipment and rehabbing the common areas. 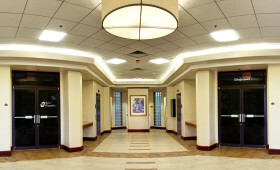 We redesigned and renovated the lobby and added a new pharmacy. We Refurbished all common area restrooms and updating to ADA compliant and painting and carpeting of common area corridors. We kicked-off an aggressive marketing campaign to make local physicians aware that we had brought the property back to Class “A” level finish and service. We instituted our gold standard level of service in all facets of leasing, property management and maintenance. Our tenant retention programs include property events, one-on-one tenant meetings, web-based maintenance tracking programs. We converted the property from Class “B-“ back to its original Class “A” level. Current tenants no longer considered relocating to newer buildings. With the exception of two retiring physicians, we maintained a 100% renewal rate. For three years after acquisition, we increased occupancy by 5% and rental rates by 15%. Among the new tenants, two practices totaling 7,390 Square feet came from a direct competitor, each signing a long term lease at the full asking rates. A nine story, 135,000 square foot medical office building. Connected to Palmetto General Hospital. Palmetto Medical Plaza had significant deferred maintenance. The building needed both extensive repairs and a new image. Furthermore, 30% of the physicians were of retirement age. We repositioned the property and reintroduced it to the market as a higher asset class and a worthy alternative to its competition. Over a two-year period, we implemented an extensive $1.7 million capital improvement project. Work included replacing the cooling towers, mechanical equipment systems, and major renovations to the common area interiors. We completely redesigned the lobby areas and restrooms, refurbished four elevators and rehabbed many of the medical suites. As part of our platform, we developed and cultivated relationships with the hospital executives and existing tenants. We instituted our gold standard level of service in all facets of leasing, property management and maintenance. Our tenant retention programs include property events, one-on-one tenant meetings, web-based maintenance tracking programs. Our efforts generated strong leasing activity and an above-market renewal rate. Through improved management and the repositioning of the property, we secured multiple practices from nearby competing properties. From the three years following acquisition, we increased occupancy from 77% to 93% while increasing the rental rates by more than 10%. The SW FL Portfolio consisted of seven medical office buildings totaling 269,944 square feet located throughout Southwest Florida. The buildings were owned and operated by a publicly-traded REIT (HRT). Some of the buildings required significant capital repairs. Several of the buildings had substantial near term lease rollover and a large portion of unfinished space. We repositioned and rebranded the portfolio with capital and cosmetic improvements to the exterior and common areas. We dramatically improved the level of service and tenant satisfaction. We reached out to the local hospital systems. In the key asset (in Venice), we built out the raw space on a speculative basis. We instituted an aggressive leasing campaign. We increased occupancy dramatically (by 15% in Venice due to building out and leasing out the former raw space, much of it to the local hospital, and by 20% in Fort Myers), and grew stabilized net operating income by 27%. We sold one building to an existing tenant and one building to a local investor. We sold the institutional grade assets to a publicly-traded REIT (ARC). A project three-building Class “A” medical office complex totaling 60,000 square feet located near I-75 and two miles from Venice Regional Medical Center. The property suffered from limited visibility and curb appeal due to overgrown vegetation and older, inferior signage. The largest of the three buildings had an 11,000 SF vacancy in raw condition and no prospects. We began a wide-ranging marketing campaign, developed relationships with the executives at Venice Regional. We worked immediately to subdivide the large vacancy into three models suites of 1,500 square feet to 4,500 square feet, to offer suites of realistic size and immediate availability. Due to our strategy to subdivide, we leased all three vacancies—one to a practice owned by Venice Regional Medical Center. Our regional team was integral in overseeing the construction process for four tenants consisting of the half of the second floor. We instituted our gold standard level of service in all facets of leasing, property management and maintenance. We took the initiative to reposition the landscaping to provide significantly more property exposure to traffic. In addition, we relocated and reconstructed a new marquee signs that afforded our tenants meaningful signage along Venice Avenue. These factors clearly played a large part in attracting and securing the new tenants to the property. In less than two years, we increased occupancy from 76% to 96%. The property suffered from extreme disrepair and severely low occupancy of 11%. Our client, Five Mile Capital, an entrepreneurial investor, hired us to rebrand and rehab the property and stabilize occupancy. The entire building–common areas, operating systems and tenant suites were in poor condition..
We designed and instituted a creative marketing campaign to reintroduce this iconic building to local office tenants. Our campaign included a billboard near the building, advertising on the City trolley and hosting a kick-off event, supporting the Palm Beach Historical Society and attended by the Mayor and other dignitaries. We supervised a $2 million effort to completely reposition the building and bring it back to its historic grandeur. Capital improvements included the repair and replacement of the major mechanical systems including HVAC, electrical systems and elevators. We salvaged and repurposed existing fixtures in keeping with the property’s historic elements. We added building Wi-Fi, a bathroom/shower and bike racks with lockers for downtown commuters. We refinished 90% of the office suites from floor to ceiling. To maximize leasing efficiencies, we systematically created model suites in a variety of sizes. We demolished and rebuilt the entire 5th floor, which was in particularly poor condition. We carefully selected restaurants for each of the ground floor vacancies. Both restaurants have been successful and provide an amenity to Comeau tenants. The property was brought back to its original stature as the elegant and iconic historic building in Downtown West Palm Beach. During our four-year assignment, we increased occupancy from 11% to 92% and lease rates by 30%. In July 2015, we sold the property at a very low capitalization rate..
Our team at Aurum Property Partners is so pleased with the resurgence of the Comeau Building that we have located our offices at Comeau.